Exchange project. Street barter. Object collection. Barcelona, San Juan, Ljubljana, Bogotá. 1998 –2002. 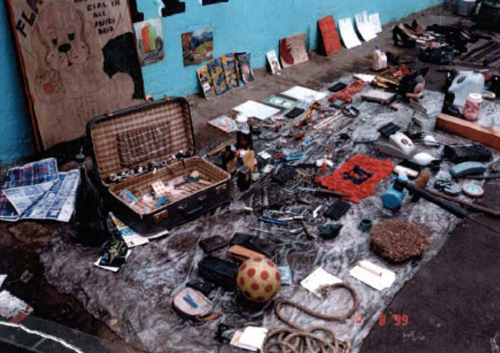 The street Museum is a barter and informal redistribution activity that provides a process of encounters and disencounters through trade and circulation of objects. It consits of a collection of artifacts and things of all kinds obtained in the streets through barter with pedestrians. Starting from a swap proposal, the collective began to “do the steet” on board of EL VELOZ, a ball bearing car, inviting people to an unlimited transaction by exchanging one object for another. Drifting through urban spaces, the Street Museum parks around any corner to exhibit and trade its contents. There is a feeling to level the use value and the trade value of these commodities by redistributing them in the reciprocal act of barter. An act where the value we give to things is agreed by those who engage i the swap. The ever changin recollection of objects in this paradoxical museum tells about the diversity of everyday life in the streets of any city and the human and social relations that we establish trough commodities and material culture. *Cambalache is a collective without members, founded in Bogotá in 1997, to promote cultural recycling and unlimited exchange. Some people in it are Carolina Caycedo (London 1978), Adriana García (Neiva 1977), Alonso Gil (Badajoz 1966) and Federico Guzmán (Sevilla 1964). Any resemblance to other collectives past or future is merely coincidental.